This is our favourite recipe to make when pumpkins are in season, the amaretti biscuits make it a really festive dish and perfect for celebration such as Thanksgiving! Peel the pumpkin and cut into chunks. In a skillet, add 20g of butter, the chunks of pumpkin, 4 tablespoons of water and some salt. Cover with a lid and cook the pumpkin until soft. Leave to cool. In a bowl, mash the pumkin with ricotta, a good grating of nutmeg, some black pepper, parmesan and the crushed ameretti biscuits. This is the filling for the ravioli so make sure it is seasoned and mixed well. Roll out the pasta dough- on the machine to setting 2 or using a rolling pin to about 1/3 of an inch thick. Cut into rectangle sheets- about 12 inch by 4 inch and place on the floured surface. Along the center of the rectangle, place acorn size shapes of the ricotta and pumpkin mixture at 3.5 cm intervals. From the top, fold the pasta sheet over the filling and seal the two ends pressing down with your fingers. Then start from one end and press firmly around the mounds ensuring you do not trap any air. Try and use the hole at the other end to push out the air. 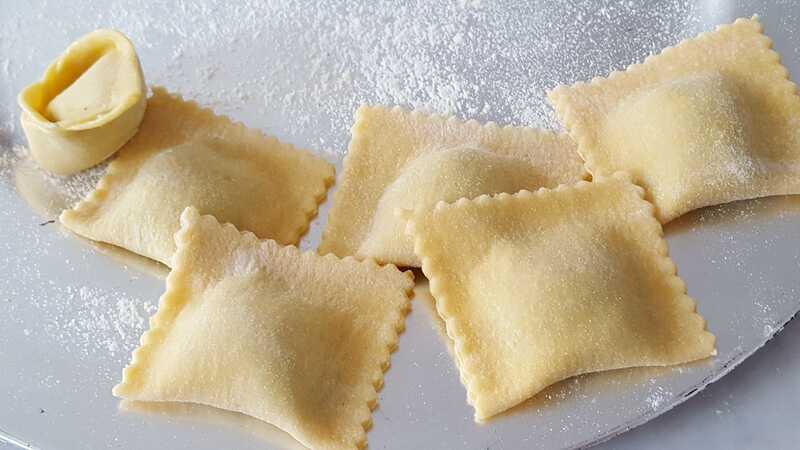 Using a Ravioli cutter-or a knife- cut the ravioli into squares and place on a lightly floured surface. Bring a pot of water to boil and salt the water. The ravioli should take about 5 minutes to cook but taste the corner of one ravioli to check- it should be soft and not doughy. While the pasta is cooking, melt the butter in a frying pan. Once it is melted, add the sage leaves,turn up the heat, and cook for one minute until they change colour. Remove the pan from the heat. Once the ravioli is ready, remove from the water with a slotted spoon, place on a plate, and pour over the butter and sage. Sprinkle with some parmesan and eat!